New head coach, Dan McFarland is not planning any big revolution at Ulster Rugby as he begins the second week of his tenure. There was obvious frustration for Ulster that the Scottish Rugby Union would not release the Englishman from his contract until a fortnight before the start of the new campaign. However, pre-season carried on in earnest until the former Connacht and Glasgow assistant coach finally arrived in Belfast. Little will be read into the two pre-season losses to Gloucester and Wasps in the recent friendlies - rather Ulster will take more heed of how they perform in this week’s Guinness PRO14 opener at Kingspan Stadium on Saturday against Scarlets. It is a baptism of fire in many respects for McFarland, plotting the downfall of the 2017 champions and last year’s beaten finalists, who also reached the European Cup semi-finals. 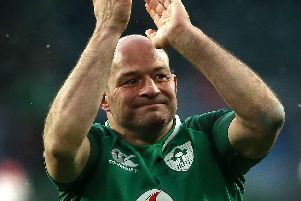 McFarland will not even have - his full squad available for selection given the Ireland player management programme - although John Cooney may get some dispensation given his involvement in the Irish summer tour to Australia. However, the nucleus of the squad is available for selection and he will get a marker of the task ahead of him this season if Ulster are to make the play-offs in May. “What a great game to start with,” beamed McFarland on Tuesday as he had his first engagement with the local media. All head coaches want to make their mark on a team, and McFarland wants to take Ulster in a new direction. “Ultimately it is my desire to play a game with speed - collective speed where our team can work at a pace that causes the opposition difficult and outlasts the opposition. “But it is a slowly slowly progress. For me coming in here my feet are on the ground and I am not going to look up too far. “I am going to take one step at a time as a coach and find out what we have here. I will get to the proper bit at the end. “A lot of that is assessing the infrastructure whether it is the support staff, the coaching staff, working out how we can all work together or whether it is the players. “Come into the proper, there are some very talented players, there are some really talented young players here, do I believe we have the kind of players that are going to play the kind of rugby I want in the long run. “We will not do it right away, it will be something which is fed in gradually. “There are foundations to put in place first. We will recruit along the lines of that as well as the mentalities and the attitudes that we need here. “I am very positive about that, and in fact if I did not think that, I would not have taken the job,” said McFarland. Ulster have tended to under achieve in recent seasons but McFarland is not setting out any expectations or asking for patience from the supporters and staff. “I am not going for anything. When you are supporters and fans part of the fun of it is making a choice on what you expect. You get to chose that, you get to look. It is not for me to tell people what to expect. “My job is to get the expectations right inside and that is expect really good standards day to day. “On the outside as fans, brilliant you know, aim high and be disappointed or aim low and be really excited. That’s something for everybody to choose,” he added.